Albinism can severely impact people’s vision making life more challenging. 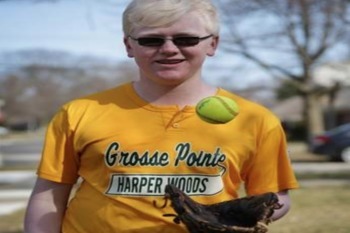 Ryan Huizdos is legally blind because of albinism, but that didn’t stop him from playing little league with the help of a bright yellow ball. Nobody had any objections about the ball until his team made it to a district tournament game in 2015. When Little League learned of the ball, the organization banned its use. A three-year legal battle ensued, and Huizdos can now use the ball when he's at bat, pitching or playing infield. SDCB can assist anyone struggling with vision loss, please contact us to learn more.